Continuum è una delle novità più apprezzate tra le funzioni che arriveranno con Windows 10 Mobile: la possibilità di eseguire le app su uno schermo esterno ed utilizzare tastiera e mouse sarà facilitata da un’apposita dock di cui abbiamo già parlato in passato, che adesso si mostra nel sito di un rivenditore. Attach your Windows 10 Mobile device to your television or monitor to experience a Windows-like desktop computer experience, using a USB keyboard and a mouse so you can use your phone for the ultimate productivity experience. Own a Windows 10 Mobile or later device and wish you could turn it into a computer? Well look no further as the Microsoft Continuum hub allows you to turn your phone into a desktop computer to use all of your favourite apps without the need to carry a laptop with you. Using a real keyboard, real mouse and a real full size television or monitor – you can use the Microsoft Continuum Hub to take control of your work, gaming or entertainment as if it was a computer. Please note: Requires Microsoft Continuum compatible smartphone to function. Using your favourite Windows 10 universal apps including Mail, Edge browser, Calendar, People, Calculator and many more – you can explore on the big screen and work more effectively. With the universal Office applications including Word, Excel, PowerPoint and OneNote – you can take your productivity to a whole new level and all of this using just your phone acting as the computer. Using apps on your phone for productivity is certainly possible and works pretty well for quick edits, however for long emails, documents, spreadsheets, presentations or web browsing – you just can’t beat a monitor or television screen. 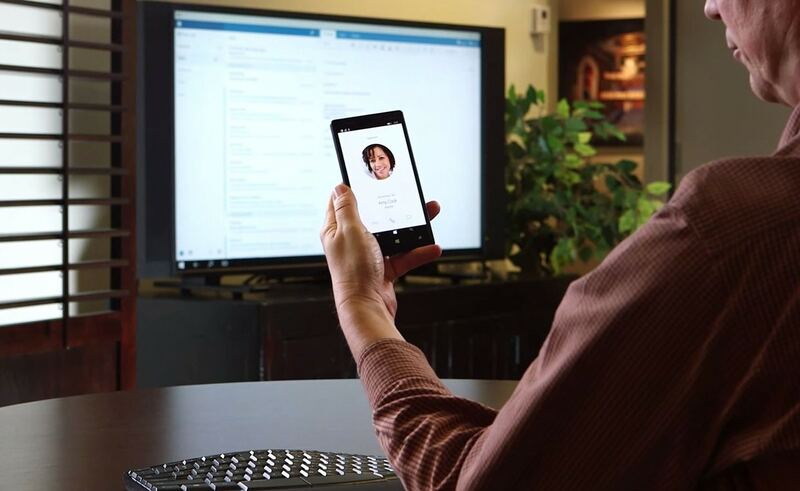 Using the Microsoft Continuum Hub, you can connect your phone to a much larger display so you can view apps as if they were full desktop applications. Attach a USB keyboard or mouse to the Microsoft Continuum Hub, allowing you to use a real physical keyboard and mouse to type and move around the desktop on your large screen display. Working on a Word document on your computer monitor and wish to send a text message? No problem, as the Microsoft Continuum Hub doesn’t completely take over your phone. Your phone screen is completely independent to the display you have your phone connected to, allowing you to send text messages, view notifications and take phone calls as you would normally. Purtroppo non è presente neanche alcun prezzo, anche se secondo diversi rumor dovrebbe aggirarsi intorno ai 100$: avranno la possibilità di provarlo i futuri possessori di Lumia 950 e Lumia 950 XL, che attualmente risultano gli unici smartphone compatibili.